Litchi. (Native Chinese name.) Sapinidaceae. One species, a polygamous tree, 12-20m. Leaves spirally arranged, to 25cm, pinnate, pinnae 2-8, to 20cm, entire, thickly coriaceous, elliptic-oblong to lanceolate, tapering at both ends, glaucous beneath; petiole to 5cm. Panicles terminal, to 30cm, in upper leaf axils; flowers white tinged green or yellow, in 5-12-flowered cymes; calyx shallowly 4-lobed or 5-lobed, segments rounded; petals absent, stamens usually 8, filaments hairy; disc annular, hairy to glabrous; style 2-branched; ovary in female flowers bilobed, to 5mm, bilocular, each locule with one ovule. Fruit a drupe, about 3.5 x 3cm, bright red to purple when ripe, nearly smooth or scaly to densely set with flat, conical, acute warts; seeds single, large, with a white fleshy aril, separate from the seed coat. S China. Z9. 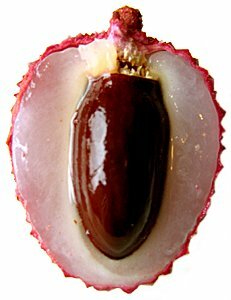 In tropical and subtropical zones, Litchi chinensis is grown primarily for its fruit, rich in vitamin C, with a succulent, translucent white aril, eaten fresh, dried or preserved in syrup. They are grown extensively in their native southern China, in India, Japan, S Africa, Australasia and, to a lesser extent, in Florida, California and Hawaii. 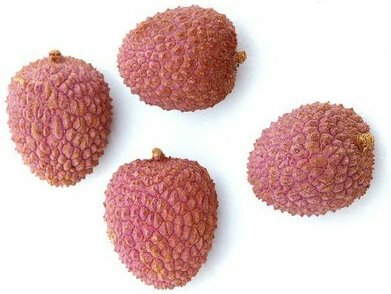 Litchi chinensis is a beautiful round-topped evergreen tree, slow to mature but long-lived, with attractive coppery-red young leaves and clusters of rosy fruits, and can be used as an ornamental specimen or in mixed plantings, in areas that are frost-free or almost so. Litchi has been so long improved in cultivation that wild forms, aside from naturallised escapees, are thought to be unknown; cultivars of Litchi, were discussed in one of the earliest-known treatises on fruit cultivation, by the Chinese scholar T’sai Hsiang in 1079AD. In the US, the most commonly grown cultivars are ‘Brewster’ and ‘Royal Chen’ (possibly identical to the Chinese ‘Chen T’sai’). Early-maturing cultivars (e.g. ‘Tai So’, and ‘Bengal’) are more suited to warmer climates; ‘Haak Yip’ yields particularly high-quality fruit. Late-maturing cultivars, such as ‘No Mai Chee’ and ‘Wai Chee’, require more chilling to fruit well. In their natural range, climatic conditions are hot and humid for most of the year, with a winter that is cool, misty and frost-free. Litchi have a positive requirement for chilling (to 7-12ºC) and winter dormancy to induce flowering, and good fruiting relies on warm humid summers, with a minmum rainfall of 1200mm. Old trees suffer injury at –4ºC, although when young they will not tolerate temperatures below freezing. In temperate zones, Litchi can be grown in intermediate glasshouse conditions. Litchi chinensis is tolerant of a range of soil types, if well-drained, but does best on deep, moist, acid soils that are rich in organic matter, since these provide optimum conditions for beneficial mycorrhizal associates. However, they have made good growth on limestone soils with the application of iron chelates, and will withstand wet soils, provided that the water is not stagnant. Plant at the beginning of the growing season, ensuring thorough soil preparation by incorporating organic matter; planting holes should be inoculated with soil from established trees to provide mycorrhizal fungi. If planting for fruit production, give a sheltered position and space at 8 x 8m (if spaced too closely, they may develop a narrower head and fruit only on the topmost branches). Protection from wind is essential, especially when young, so screen if necessary. Litchi is shallow-rooting; avoid surface cultivations and use a mulch to conserve moisture and suppress weeds. Irrigate in dry weather. Prune young trees only to establish a well-spaced framework. Older specimens may be rejuvenated by heavy pruning followed by the application of fertilser. The scoring of branches in autumn is sometimes practised to induce heavier flowering the following spring. The fruit is harvested in entire panicles, about 100 days after blooming, and should be fully mature when picked since they will not ripen off the tree. Propagate by air layering, grafting, or from greenwood cuttings under mist in summer. Propagation from seed is possible, but fruiting quality will be variable, and specimens may take up to 15 years to fruit. Seed quickly loses viability on removal from the fruit, and should be sown fresh, 1cm deep in a loamless propagating medium. 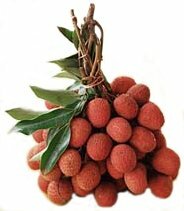 LYCHEE; LITCHEE. As for the genus. Subspecies chinensis. Twigs slender, diameter to 3.5mm. Subspecies philippinensis. Leaves with pinnae in 1-2, rarely 3 pairs. ‘Brewster’: vigorous; fruit medium to large. ‘Groff’: fruit small but meaty, in large clusters. ‘Kaimana’: vigorous; fruit large, juicy. ‘Haak Yip’: compact; fruit small to medium, in large clusters. ‘Tai Tso’: vigorous; fruit medium, very juicy, clusters large. ‘Wai Chee’: compact; fruit and clusters small. Subspecies javensis. Twigs thick, to 7mm. Flowers in sessile clusters.